Celebration of the SUMMER SOLSTICE! 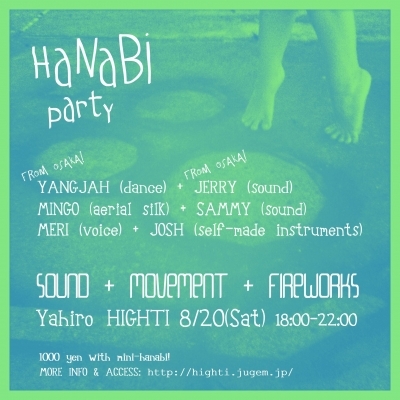 A night of sound, movement and Japanese fireworks! Inside and out on the roof, on the ground and flying in the air, colorful creative explosions and sparks of infinity. 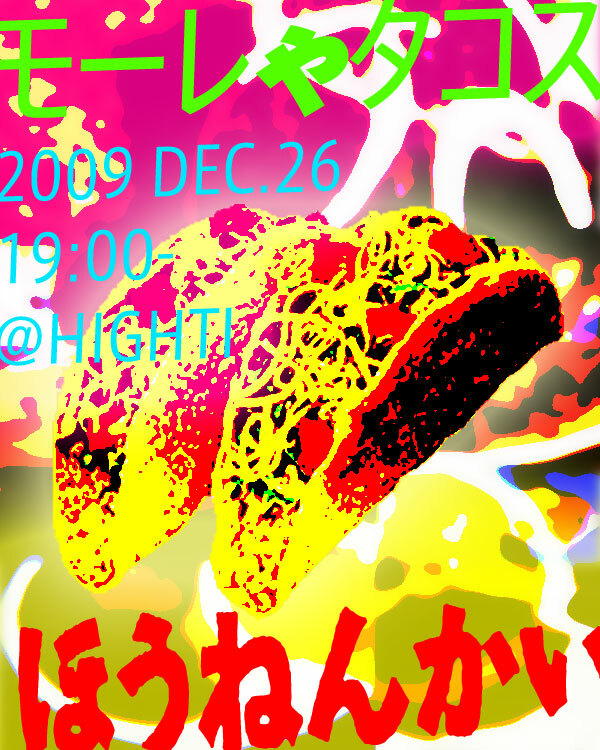 Admission: 1000 yen including Japanese mini-fireworks! YANGJAH is a Korean diaspora born in Japan and living in Osaka. She searches for her own expression of body while working on improvised collaborations with a variety of artists in many kinds of spaces - inside/outside spaces, in Japan and abroad. She produces installation and video works. She seeks the circulation of moments which can become fulfilled through an empty body. Jerry Gordon is an improvising musician and poet living in Osaka, originally from Los Angeles. He plays wind instruments and percussion with a focus on acoustic sound. Jerry enjoys seeing how the sounds of objects reveal themselves through contact with his concentration. 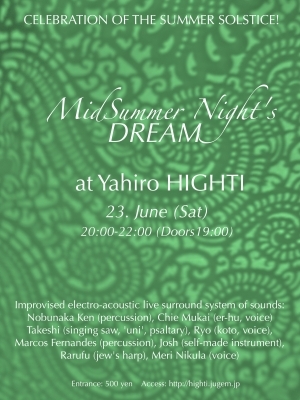 He collaborates with various musicians and dancers in the Kansai area but has played most extensively with Yangjah over the last few years. Joshua Hume (aka Lead Sister II) is a DIY sound artist from Texas USA, now living in Chiba. His self-made instruments build from scrap wood and other curiosities transform noise into hypnotic layers of music of a unique blend, creating an experimental, folky, polyrhythmic sound hammock to swing on. He has a duo with Meri Nikula called 'Astral Fruits' and they are currently working on new material. 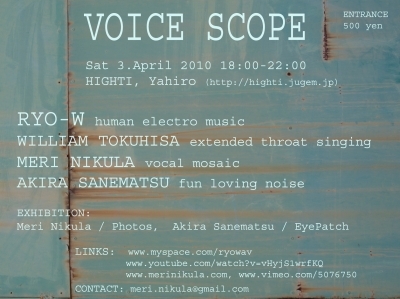 Meri Nikula is an experimental vocalist, video artist and a performer from Finland. She has studied art and various music traditions around the world and uses a limitless range of vocal sounds creating her own 'vocal mosaic'. Meri loves collaborating with dancers, also using movement as a performer, mixing the roles in search of creative freedom. Sammy expresses mists of crinkled throngs as he splashes myrth upon the drocks. Accordion of choice, hands upon bellows, crank up a wind, wind and grind boxes of buttons pop springs and gush chords with angles of ex-static-tri-city. 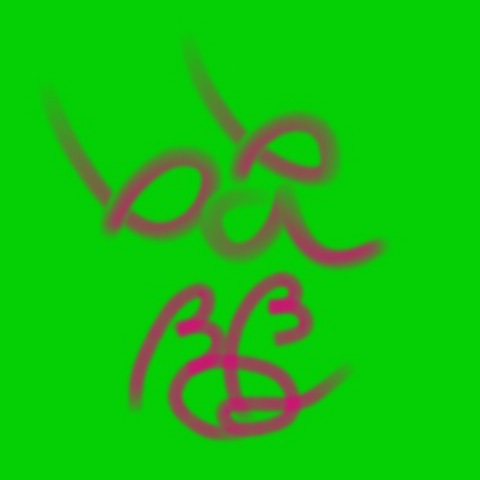 Pounding feet on the resonant wood board boxes and bell slinging in your rings as he sings. Sam has performed on the street as a homeless for several moments and in some corners of dark chambers of the absurd, from the rocky shores of Maine to the piss and vomit laden cobbles of Edinburgh and on to the desolate windswept planes of Harajuku. 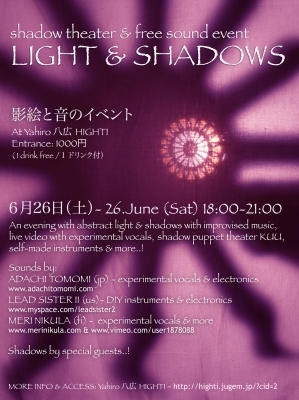 LIGHT & SHADOWS - Meri's Sayonara Party! The power of human voice!!! RYO-W - human electro !! 徳久 ウィリアム孝太郎 - extended throat singing! !